How do I keep the point on my Ohio star after border is on? Thread: How do I keep the point on my Ohio star after border is on? Good morning! I have been working on Ohio Star blocks this morning and the points are matched in the center, but if I add a border, I am losing my points on the outside. What do I keep doing wrong? Sounds like 1 of 2 problems: Either you are sewing with too large of a seam allowance, or your seam allowance beyond the point of the star is too small. How much fabric is there at the point of the star? Can you post a picture? There should be at least 1/4" of fabric beyond the star points. Trust me, make a star block for practice as many times as it takes to get the 1/4" seam allowance on each point. If you are squaring up your blocks you may be cutting off the 1/4". This is one of the pieces before squaring up. I am not ending up with any seam allowance on the edges. LOL off for more practicing. Okay now I'm confused. That's not an Ohio star block, and you don't have to worry about seam allowances on that block. I think that is one of the components of the ohio star block - the pointy units. That looks good - the center of that unit is matching up nicely. The problem is probably occurring when the side squares are sewn on. That is where the 'right' seam allowance matters. Last edited by bearisgray; 08-14-2013 at 07:23 AM. Last edited by BirdyFeathers; 08-14-2013 at 07:25 AM. Ah I'd wondered if that was the case. 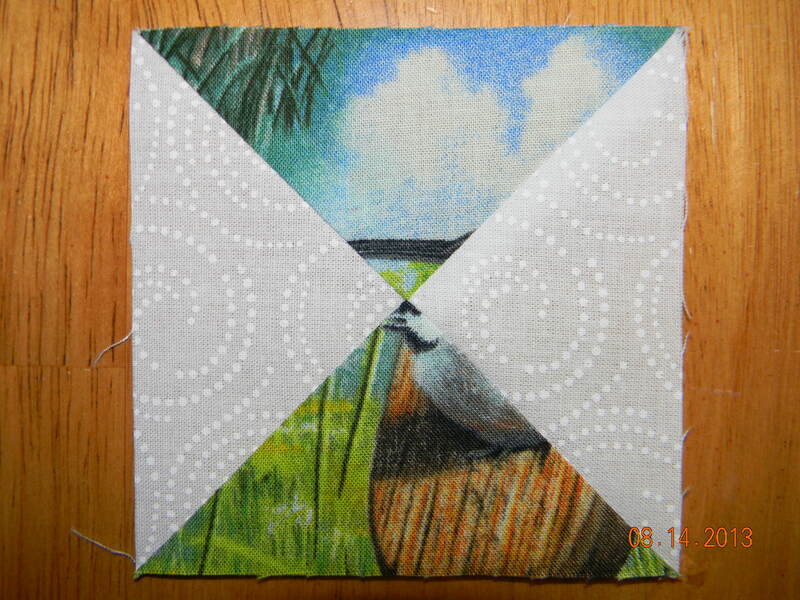 Birdy - when you sew that segment of the block to its neighbors, the points will end up 1/4" from the edge, which will give you your seam allowance for the border. So what happens when you sew the side pieces on? In this example, after you sew the white block to the red and white hourglass, or X, the tip of the red triangle should be 1/4 inch from the top of the block. here is a smaller one I tried and I lost the point with my border. I even tried using a scant 1/4 seam allowance on some and still lost my points. The points aren't as lined up on this one, but it shows how the borders took my edge points. Okay I think you have several things going on here. First, when you iron your segments, make sure you are moving the iron in an up-and-down motion, and not wiping the iron across the fabric, which will stretch the bias. Second, I think you need to square up your hourglass segments before sewing them into the block. That one in the center left is way too tall. The hourglass segments should be the same size as the reddish fabric you're using in the corners. yeah I noticed that with the center left one too. Makes the square wonky. I think I might be stretching them some when I press, pulling the fabric. I'll have to keep practicing, hopefully I get this right before the day is out LOL. Thanks so much for your help. I appreciate it! When you look at the quarter square triangles, the outside red triangle is smaller than the inside red triangle, which means that you are not cutting your squares evenly before you begin to sew them back together. 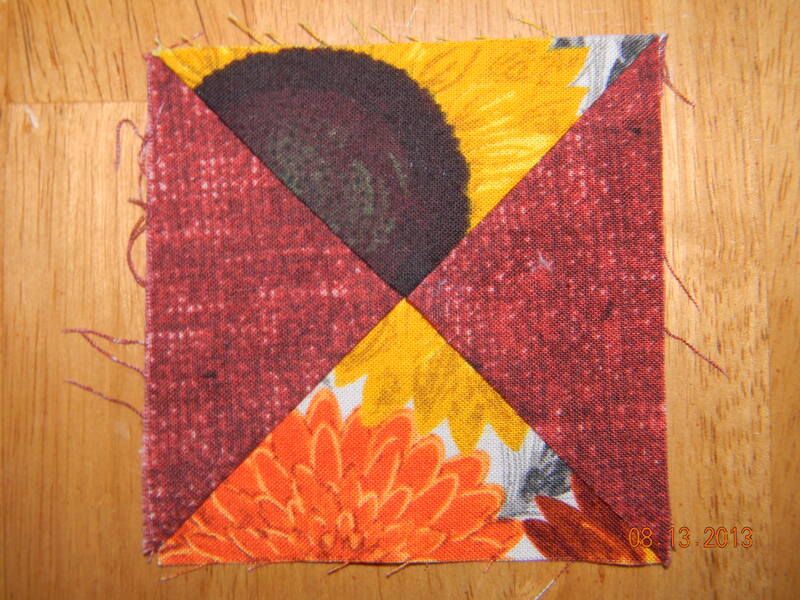 Use a pencil to mark 1/4 inch seam allowance on all sides of your block. Now you can see where the seams will take away as all pieces are attached. If your points are all good as the first picture of the square, it should work out fine. When you square up your block, use the diaganal line on your ruler along the seam. Put the half way measurement at the center of the block and trim from all sides. It is easier to HSTs without cutting the squares into triangles -- cut the squares larger, draw center line on back of one square, sew 1/4" down both sides of line, cut triangles apart on centerline, then draw center line on back of one HST, place 2 HSTs right sides together, sew 1/4" down both sides of line, cut apart on centerline. Then square up the QSTs using your favorite method. That way, you don't have to handle the fabric on the bias and there is less chance of the blocks stretching. Thank you so much for all the helpful info! I will be working on squaring them up better too. I didn't square them up much in the practice square because I already didn't have a seam allowance and was afraid that I would get into my star too much. Maybe this illustration will help? 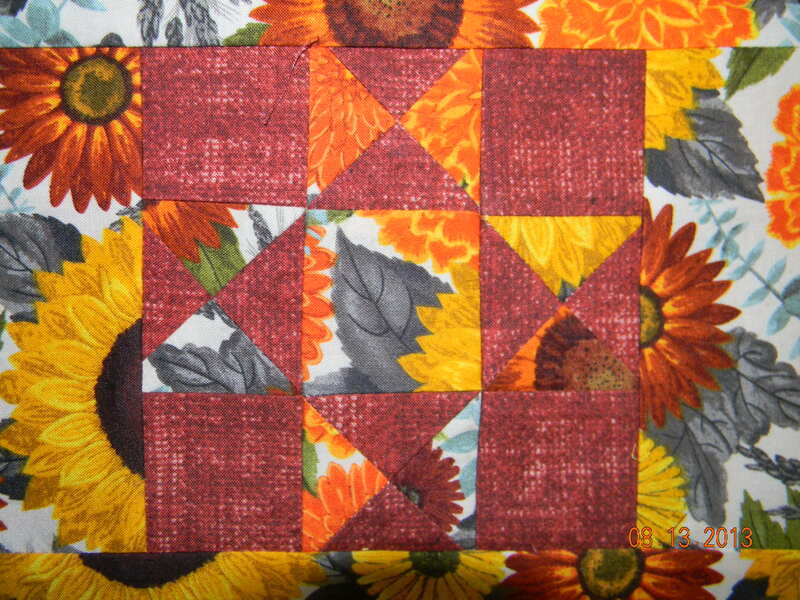 This block requires that each segment of the 9 patch be the exact same size before you sew them all together. I am working on a quilt with some of these and there is not much "fudge factor". If you measure each of the 9 segments, you will see where you are not square. okay, well the day is almost over and I still can't get any seam allowance left on my squares. 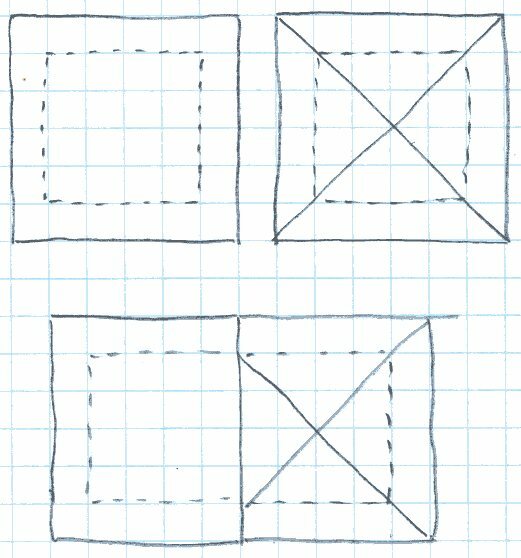 If I don't block them up in a perfect square with 2 sides long and 2 shorter, then I have a seam allowance. I forgot about my June Taylor half square triangle and quarter square triangle ruler until later tonight, so I got that out and tried, but still don't have any seam allowance if I square them into a perfect square. I don't even see a seam allowance when I am finished sewing, only if I square up 2 sides different from each other do I get any kind of a seam allowance, and I know that's not right. *sigh* I am giving up for the night. Thank you all again for all you help, I don't know why I can't seem to "get it" Here is one of my latest squares with again no 1/4" seams. This has already been squared, but the hourglass shapes went clear to the edge even before I squared it. Wondering if the problem may be in the way you are squaring the blocks up. can you post a before squaring photo? Last edited by BirdyFeathers; 08-14-2013 at 05:58 PM. This block is perfectly fine, there is nothing wrong with it as long as it's square. Now you need to make 3 more just like it, all the same size. Cut your other blocks all the same size, all square. When you sew these hourglass blocks to the solid corner blocks, you will see the seam allowance. The points will not go all the way up to the corners. Thank you everyone for all your patience and helpful info!!!! I appreciate all of it. Last edited by BirdyFeathers; 08-14-2013 at 06:24 PM.